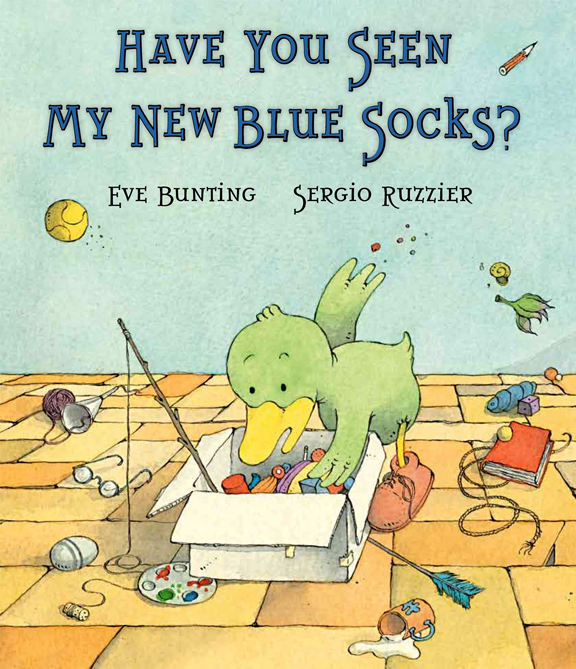 Toddler: Rhyming Words and Have You Seen My New Blue Socks? Toddler storytime is full of little ones these days. The caregivers are hungry for tips and are so enthusiastic. The kiddos are moving to the rhythm, clapping, signing, pointing to the book illustrations, touching the felt pieces and just generally getting into storytime. What a blast! Weekly Early Literacy Tip: Singing nursery rhymes or other songs is fun and fosters early literacy! We usually sing slower than we speak and as we sing kids can more easily hear the individual sounds in words. This is called phonological awareness and will eventually help your child sound out words when they are ready to read. often the ending sounds are the easiest to hear, so we’re focusing on rhymes today. I brought along my monkey puppet to sing with us on this next song. This crowd LOVES puppets. Bunting’s book reads well as a story, unlike some rhyming stories that seem forced. The amount of text, story line and word choice create a pacing, when read aloud, that encourages emphasis on the rhyming words and offers opportunities for the youngest storytime kids to interact with the illustrations and make connections with the text. One on one sharing allows for even more conversation, reinforcing the value of this title as a repeat read. This felt game was inspired by erinisinire. 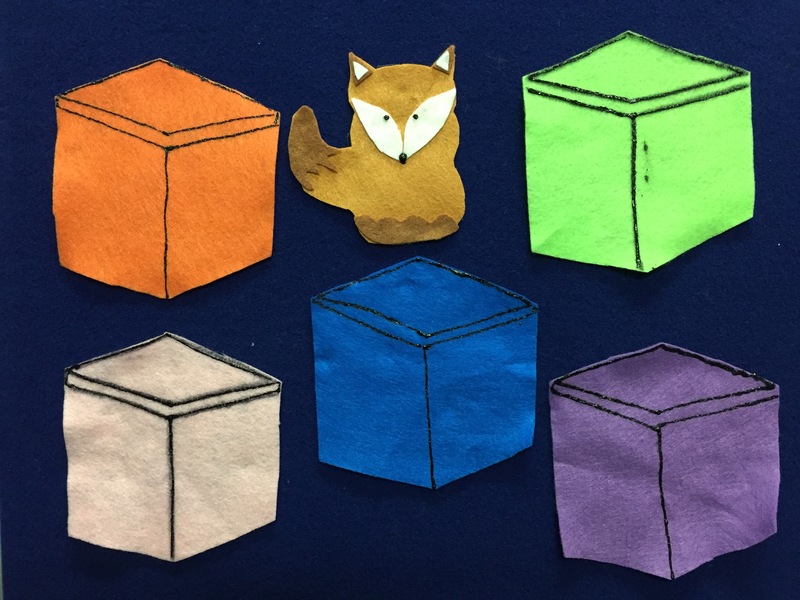 Lots of people have versions of this game (and it’s cousin Little Mouse, Little Mouse) as Jbrary found out, but I do love this fox the best and it ties nicely with the book we shared this week which includes a fox and some boxes. I used my Folkmanis fox puppet (called Big Fox in this game instead of mom or dad fox) to add another dimension and reinforce the concept of big and small. Some of the toddlers wanted to hide the fox as well as find it which worked out great because the hiders still let us say the rhyme and were surprised when we found it behind one of the different colored boxes! Before we sang this song and popped bubbles together, I mentioned why I count starting with my thumb. We count to three a lot during this storytime to show how easy it is to integrate counting (math) into daily activities and I always start with my thumb. These first three fingers are essential for pinching and grasping small objects and will later be used to hold a paintbrush or writing tool. Bringing out a box of scarves after I put the bubbles away is a great transition! Before our next song which used different colored scarves, I explained and demonstrated what we were going to do with our scarves and then we sang together. For example we were going to wave the scarves overhead and then rub our hair. …on your toe, way to go! If you’re happy and you know it, wave your scarf. If you’re happy and you know it and you really want to show it. Time to clean up our scarves! I usually have a bag to put the scarves in, but today I brought a box so we could sing this song! Today I brought out the paint dobbers and some plain white paper for toddlers to try. For some kids, it’s their first experience painting. For all of the kids and adults, it offers a great opportunity to experiment with and talk about colors and patterns. What do you do when you have barely a voice left (because of some weird cold going around town), you feel otherwise fine, and you have no subs? You modify toddler storytime and carry on. As you know, my toddler storytimes involve A LOT of singing, rhymes, and finger plays mixed in with the books. This routine is much harder to do when I can only squeak a few notes here or there. Now my singing voice isn’t anything to write about or even mention, but this week, it was downright awful. I couldn’t even try the ol’ “if I can sing, so can you” trick I often pull out. So, plan B.
I’ve been considering how to shake up this storytime for several weeks and this was my opportunity. I’m not sure if its the kids’ ages, the lovely Spring weather we’ve been having, the storytime space, or my program, but the kids have been wandering and restless. So, I cut storytime back to twenty minutes and then provided materials for a thematic craft. The caregivers were a little shocked and took a few minutes to get into the idea, but it worked out well. I mentioned that the craft provided a great opportunity to talk about the different shapes and colors which would later help them with letter recognition since letters are made up of different shapes. The craft also became a fun toy! This week was Bird week, in honor of the annual Kachemak Bay Shorebird Festival, a celebration of the Spring magic that occurs when zillions of birds migrate through Homer to eat on their way North. Some stop for the summer, but many head to the tundra or the coastline of the Arctic. It’s quite spectacular. One named east and the other named west. Fly away east, fly away west. Fly back East fly back west! Fly north Jack, Fly north Jill. Fly south Jack, fly south Jill. 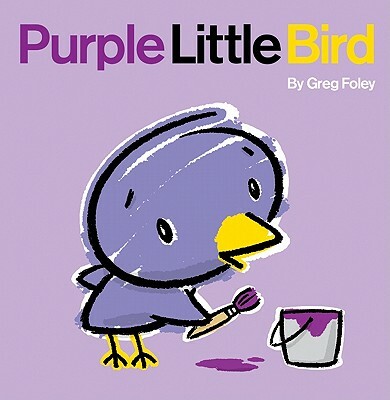 This sweet story of a girl who is mesmerized but the varied birds she sees out the window is perfect for toddlers. It was the only time I captured the attention of all of the two year olds who attended storytime this week. It offers opportunities to talk about colors and movements and fit nicely with our craft. 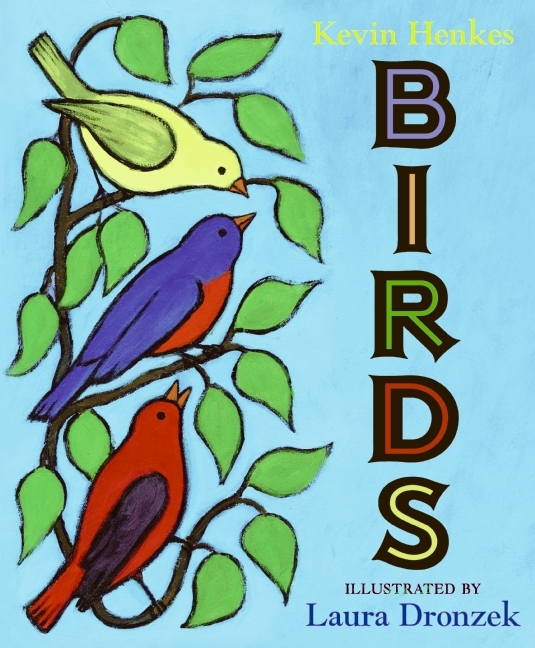 Despite being another color rich picture book, this simple story about a bird who wanders off from his perfect home in search of “greener pastures” did not capture the hearts of the toddlers. I’d give it another try under different circumstances though. For many of the younger ones, this was their first craft. I found it in a book we recently purchased called Artsy Toddler Storytimes: a Year’s Worth of Ready-To-Go Programming. There are some great storytime ideas inside and each section features a craft to go along with the theme. The bird theme is the first that I have tried. The craft worked well for a smallish group of of 10-15 kids, but I’m not a fan of pre-cutting every piece of a project for many more than that week in and week out. I like to give kids more control over the project normally, but I do think this project was age appropriate. Anyway, I think I’ll seriously consider adding crafts for toddlers to my library’s programs ‘s some for or another. I love what art can do to extend the storytime experience. Stay tuned for what I decide to do! 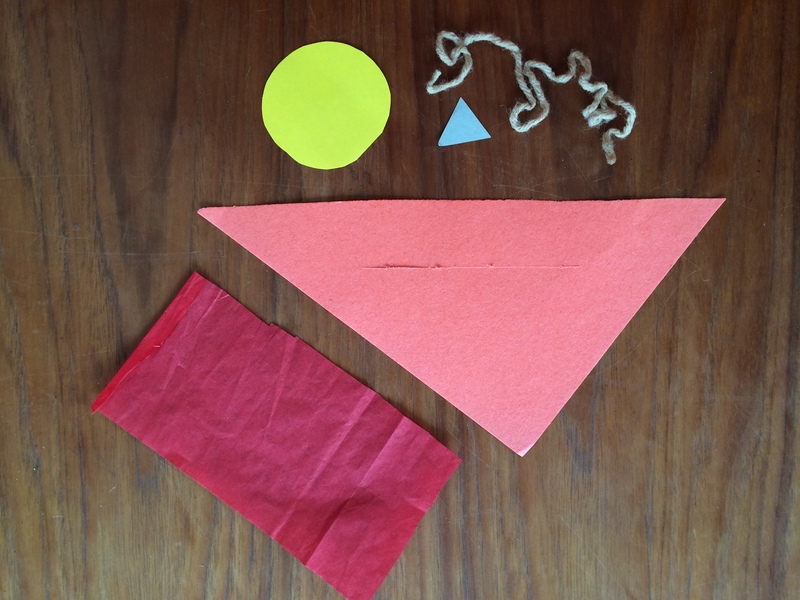 Do you do a toddler storytime with art projects? How does it go for you? Each child and caregiver chose these parts from a selection at each table. I encouraged the kids to pick the pieces and select different colors for each part. They glued the head, nose, and body together, slid the tissue paper through the pre-cut slit in the body, and taped the yarn behind the head. The finished product flew around the library behind smiling toddlers! With the upcoming state fair, I decided to focus on farm animals this week. Kids love farm animals and many of the families in my storytime crowd have chickens or farm animals at home. There are so many great books, songs, puppets, and apps about animals, animal sounds, and farm animals, in particular, so I couldn’t miss! We began story time with the song cube. The experienced kids demonstrated how the game works and the new-to-storytime kids sang along. 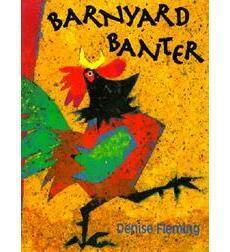 While I had several books ready to read, I started with Barnyard Banter by Denise Fleming (Holt, 1994). This is one of those wonderful books where the images (handmade paper illustrations) are as energetic as the playful sounds created by the text. The book follows a goose who has wandered off in pursuit of a dragonfly (or butterfly according to the storytime kids). Each page features animals and their sounds. While all of the other animals are where they should be (“The cows in the pasture, moo moo moo…”), goose is not. Where is he? Before turning to the first page of the story, we learned the meaning of a new word! None of the kids knew the definition of banter so I explained it and we all said it aloud. Moo, moo, moo, moo, moo, moo. As we sang the Farm Sounds song, I introduced my farm animal puppets which are always a hit with the kids. Many of them wander off after I used them for the appropriate verse in this song to be loved and cuddled in the arms of a storytime child. They always make it back before craft time, so it works out. Next we played the Animal Sounds game! This game uses an app for the iPad (Animal Sounds-Fun Toddler Game by Innovative Mobile Apps) that is designed in a flashcard style. Photo images of animals and recorded sounds are used to connect kids with the image of an animal, the sound it makes, and the written name for each animal. The way we used this app is similar to the method used by Anne Hicks at Anne’s Library Life and other librarians incorporating new media into storytime. To play this game, I held the iPad in front of the group of kids. (We don’t have a large screen or monitor in our children’s library, so I only use apps in story time that are easy to see on the iPad screen.) I explained the game and then turned the screen towards me. I tapped on one of the animals which played the animal’s sound. We guessed which animal would make the sound we just heard and then I turned the screen to the group and we decided if we were correct. As I showed the image of the animal I pointed to the text and read the animal name. There are two images for each animal so sometimes I would show them the second image which was often a group of the animal (herd of cows vs. one cow). We talked about tricky animal names like sheep that refer to one and more than one while we played. The animals are organized alphabetically, so before story time I went through and found all of the farm animals I could use to make them easier to select during the game. There are a variety of animals included and the additional in-app purchase of animals is worthwhile. This is a game that is made better by joint media engagement. Playing together and the mystery generated by our guessing game left us all in giggles and made for a positive experience for a variety of age groups. After the app game, we read Sakes Alive! A Cattle Drive written by Karma Wilson and illustrated by Karla Firehammer (Little, Brown, 2005). This rhyming story about two cows that take off with the farm’s truck for a drive through town ends well and is a silly story featuring many of the animals we saw in earlier parts of storytime. It’s not riveting, but it makes for a nice last book in storytime as kids become tired and attention wains. To round out the story portion, we sang a couple of verses of Baa, Baa Black Sheep using my different colored sheep. I had intended to also read Where is the Green Sheep? by Mem Fox and Judy Horacek, but alas, we ran out of time. 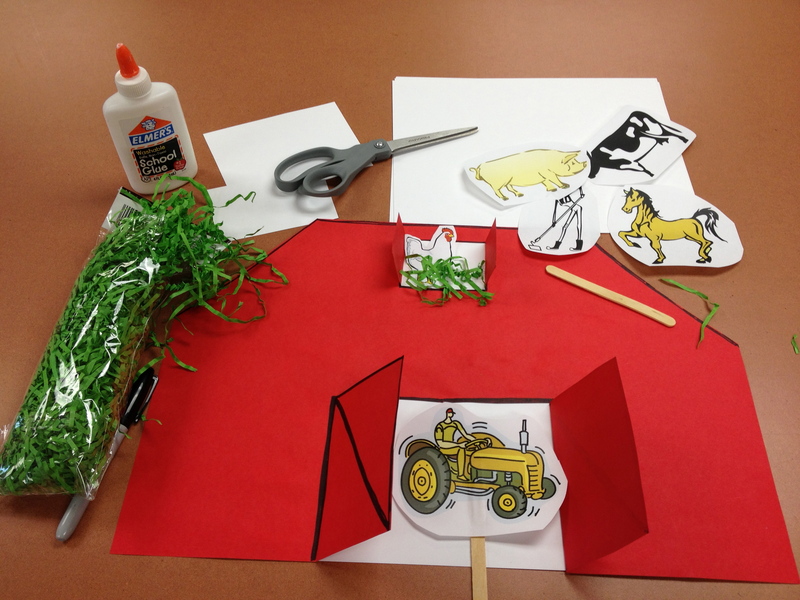 We made barns and farm animal puppets (plus a tractor) so families could extend storytime and use the craft to create farm stories of their own at home. To create the barn for kids I took a red sheet of 12″x18″ paper and pre-cut two corners off the top which became the roof. I then drew a t-shape in the center of the bottom of the page that kids would cut along to form the opening barn doors. I used a box cutter to also pre-cut a door near the top for the hay loft. For my sample, I then glued a 81/2″x11″ sheet of heavy paper on the back covering the door to make the barn stiffer and to allow space for kids to glue the tractor or other animals in the doorway. I also glued a 1/8 page of the same heavy paper behind the loft door for a chicken and some green raffia (a nest). I found farm animal images in clipart and compiled them on one sheet so each child could take a sheet, color the pictures, and cut out the farm animals they wanted to add to their barn or glue on to popsicle sticks to use as puppets. Kids decorated their barn in a variety of ways, some of which resembled barns from one of the books we shared. Summer is here! While the weather is still a bit cool, but school is finished for the year and everyone is excited about what lies ahead in the months to come. Our summer reading program has begun (a week early this year to coincide with the closing of local schools) and so have the summer storytimes. This week, I decided to celebrate the fun expected in the months ahead. Before we read together, we sang together. I introduced the Rhyme Cube, or Song Cube as I call it, which I adopted from Anne Hicks over at Anne’s Library Life. It’s a valuable early literacy tool that is rewarding and fun for kids. I demonstrated how the Song Cube works by rolling the cube in front of the kids. When the cube stopped, an image of the letter ‘A’ and some ants, a smiling sun, a spider, etc. was facing up. Below the image was the name of the corresponding familiar rhyme or song. I made the cube using an empty tissue box which I wrapped in paper. 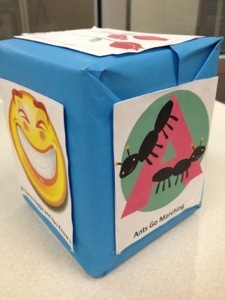 On each side I hot glued a different image and song/rhyme name to the box. I then taped the whole box (not pictured) to help it last a bit longer. A few kids took turns rolling the cube and we sang the song selected. All of the songs were familiar which made it easy to get the crowd singing along. Each child that rolled the cube smiled broadly as the group sang the song the child chose.It’s a fun way to start storytime and allows families to trickle inn while families already present engaged while they wait. What is the early literacy value of the Song Cube? Emphasizing the rhyming sounds as we sing the favorite songs builds phonological awareness. It’s also a valuable tool for print awareness. The image on each side relates to the song and becomes a symbol referring to a specific song, much like letters organized in certain combinations in a word or words in the name of a song. I point to the words below each image in the sides of the cube and children see the name of the song. In addition to camping, summer for kids in our cosmic hamlet means fish, berries, and lots of free play in the long Alaskan days. So, we read a selection of favorite picture books about these pastimes. Marla Frazee’s A Couple of Boys Have the Week Ever (Harcourt, 2008) is a fun book about summer, grandparents, play, and boys. Jamberry by Bruce Degan (Harper & Row, 1983) was our second book. The kids love finding the silly additions to the scenes on each page. Toast and berry waterfalls always cause shout outs. The variety of berries familiar to Alaskan kids from summers of picking makes this book a favorite. 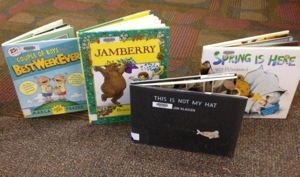 Our last book was the wonderful This is Not My Hat, the 2013 Caldecott award winning story by Jon Klassen (candlewick, 2012). It’s a smart, witty story perfect for preschool age kids who love anticipating the tale of the small fish who steals a hat from a very large fish and attempts to hide behind a kelp forest. What happens when the large fish follows the small into the kelp forest? We’ll never know. Before our craft time, we sang around the campfire! And you cook it ’till it’s brown. That’s what I’m talkin’ about! Yum! 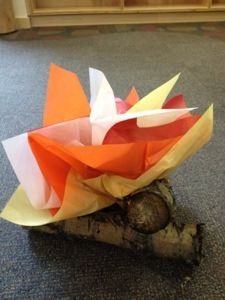 Our craft was a paper campfire. 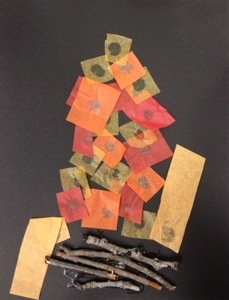 The kids enjoyed gluing on the small colored tissue paper squares on to the black cardstock where the flames would be and small sticks where the logs would be. It was a simple craft with simple supplies. I needed a storytime at the last minute, so I decided it was time for our unbirthday party! 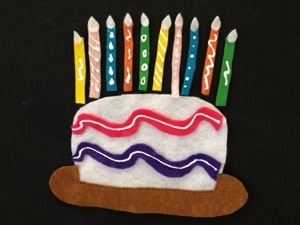 With a few balloons and streamers to decorate the children’s library, a birthday cake (felt), birthday hats (today’s craft), and some great songs, we were set. It was a silly day! Kids had never heard of an unbirthday so we first talked about when everyone’s real birthday is celebrated. Most kids didn’t know their exact birthdays, but we eventually got everyone’s day figured out. We then sang both Happy Birthday and the Unbirthday Song! Happy birthday not to me! We then talked about what we need for a birthday party: decorations, invitations, presents, and cake! Let’s make a cake! To make a birthday bright! I had the kids pick the frosting colors, instead of just saying pink, but included white for the rhyme. The first book we read together was Froggy Bakes a Cake by Jonathan London and Frank Remkiewicz (Grosset & Dunlap, 2000). These kids love Froggy! Our birthday was out of the oven now and frosted beautifully, so the last thing to do was add the candles. I made two of each color candle so we could put them on in a pattern the first time. I found this counting rhyme that go along with my felt cake. This was a tricky one, but the kids figured it out by the time we got down to 4 candles. The visual of taking two candles away each time we blew out the flames helped immensely. We put the candles back on the cake any which way and then sang the song a second time. Ten little candles on a birthday cake. Wh! Wh! Now there are eight. Eight little candles in candle sticks. Wh! Wh! Now there are six. Six little candles, not one more. Wh! Wh! Now there are four. Four little candles, red and blue. Wh! Wh! Now there are two. Two little candles, one by one. Wh! Wh! Now there are none. With all of this singing, we had time for one more book. We decided on I Want Two Birthdays! by Tony Ross (Lerner Publishing Group, 2010). It’s a great story about why we don’t have a birthday everyday. 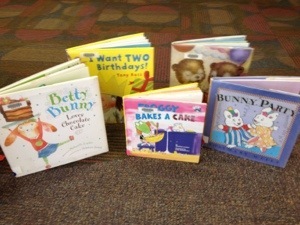 The other books I pulled out for storytime were checked out and taken home to be shared one on one. Perfect! Our craft was the final piece of the party planning- birthday hats! 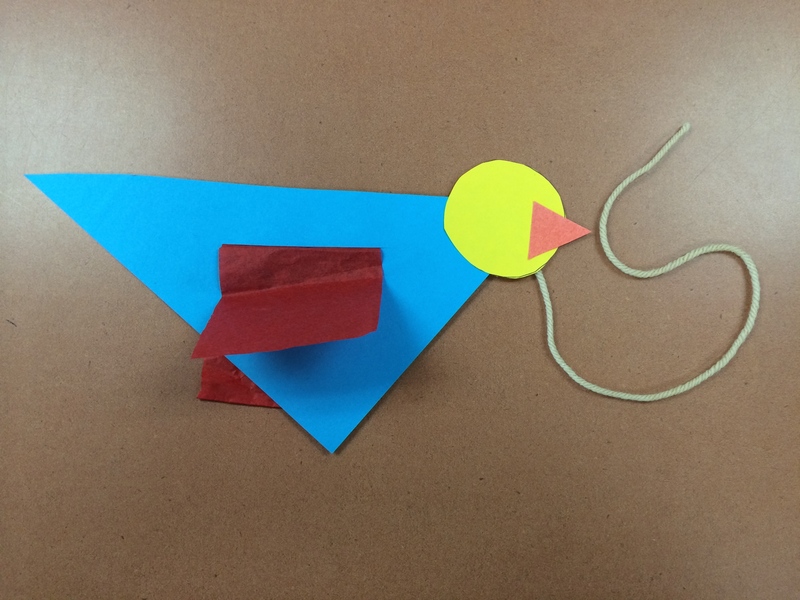 This simple craft had kids hard at work. I copied this template onto white cardstock so kids could cut out the hat. They then decorated the hats with crayons, markers, and stickers. Before bending and stapling the hat into the cone shape, parents helped kids staple streamers on the top. We used yarn to ties the hat on kids’ heads which worked just fine. 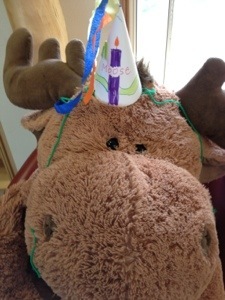 Our library’s moose even got a hat for the party! Once we had the hats made, we played my favorite party game- musical chairs. For storytime, we used the beanbags found in the children’s library and changed the game a bit. Each time I stopped the music, we took a beanbag away and kept all of the kids in the game. When the music stopped the next time, all of the kids had to squeeze onto the remaining beanbags. Eventually, all of the kids were piled on to one beanbag. Lots of giggles ensued, as you can imagine! My music choice? Andy Mason, who will be visiting the library this summer from New Mexico.